Surmang shedra. The 2009 construction season at the shedra complex drew to a close in October. Approximately fifteen construction workers were present at the shedra this past summer. Among the tasks accomplished were the waterproofing of the shedra roof, laying of the stone flooring in the residential areas, work on various masonry and stucco details, completion of interior plastering, and the construction of a retaining wall in the hillside at the rear of the shedra. There remains a large amount of painting, artwork, and other finishing work before the shedra can be consecrated. Whether the construction work on the shedra can be finished in 2010 will depend principally on the availability of funds. Chökyi Senge Trungpa XII Rinpoche, currently 20 years old, has been studying at Serta in eastern Tibet for most of the past year and a half. Serta is a great dharmic institute established by H.H. Khenpo Jigme Phuntsok, with more than 15,000 students. Trungpa Rinpoche also spends time at Surmang, learning its particular dharma traditions. 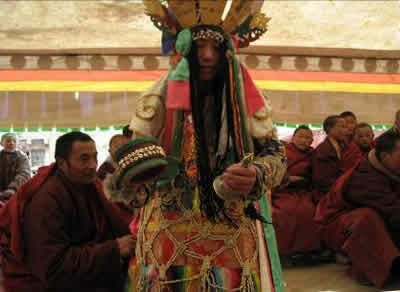 In September/October of 2009, he studied the Chakrasamvara dance, and will be participating in the annual Chakrasamvara Dance at Surmang after Losar (Tibetan New Year). In addition to performing practices and spending time with the Surmang monks, Trungpa Rinpoche accompanies the monks on visits to local villagers, doing prayers for those who are sick or dying. 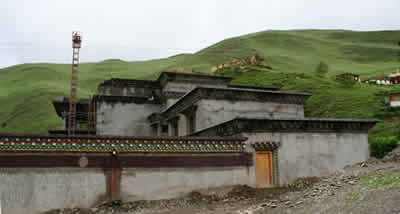 Once the shedra at Surmang Dutsi Til is completed, which includes living quarters for him, Trungpa Rinpoche will assume his seat and begin teaching there. Konchok Foundation is providing annual financial support for Trungpa Rinpoche’s living expenses and education. Support for the Surmang monks in retreat at Dorje Khyung Dzong and Dechen Choling is also provided yearly. Education program for children of Surmang. Surmang was able to have an education program in the past year that included most of the children in the village from ages 6 through 12. This took place from November 2008 through spring of 2009 thanks to support from a group of European patrons.